Michiganders have come to expect that once a year, their governor will appear on TV and put a happy face on the state of our state. That’s the way it’s been, by and large, for the last 16 years, under both Democratic former Gov. Jennifer Granholm and GOP former Gov. Rick Snyder. While both leaders did address problems in Michigan — Granholm with the decade-long recession and Snyder with the Flint water crisis — they were far more comfortable looking on the bright side. But Gov. Gretchen Whitmer is expected to take a different, more realistic tack. The overarching theme for her first State of the State speech, which is set for 7 p.m. Tuesday at Michigan’s Capitol, will be making Michigan is a home for opportunity so residents can thrive. As Whitmer prepares to present her first budget proposal in March, she may be lowering expectations for what can be accomplished. The governor earlier this month expressed frustration that Snyder and Republicans spent down $500 million of the state surplus with a last-minute, 2018 Lame Duck budget supplemental. The cost to fix Michigan’s roads — the governor’s signature issue — is pegged at more than $2 billion annually. Whitmer is expected to outline the challenges the state is facing after the last eight years, starting with state government as a whole. After meeting her promise to meet with every state department — which she’s posted about on social media — Whitmer will discuss key problems: low employee morale, lack of diversity and lack of resources. She is likely to call to address these issues by reforming state government. And she will probably recognize one of the state employees she’s spoken to. The two big policy fronts Whitmer is expected to hit on are public education and, of course, her campaign mantra of “fixing the damn roads.” The Advance has learned that Whitmer will almost certainly use that phrasing — which sparked some criticism during the campaign — and could make her the first governor to use the “d-word” on the dais for the SOS. She likely will frame roads and schools as dual challenges that are harming Michigan’s long-term health. She also will, unsurprisingly, call for an investment in public schools. And she likely will note a recent report from her alma mater, Michigan State University, that showed that Michigan’s education funding is worse than any other state, as the Advance previously reported. The governor probably will acknowledge a teacher in the audience who has been on the front lines. As for infrastructure, Whitmer is expected to argue that Michigan has the worst roads in the country, but “we don’t need a report to tell us that.” Recent severe problems, like chunks of concrete falling from overpasses onto cars and I-75 having to shut down due to potholes, will be pointed out to make the case for a long-term solution. She probably will touch on a few other policy areas, such as health care. Whitmer is likely to note her letter to the federal government last week notifying officials that she wants to work with the Legislature on changes to Medicaid work requirements. A recent study showed almost 200,000 could lose health care as a result of the change enacted last year. And Whitmer is expected to voice support for Attorney General Dana Nessel’s action to join a federal suit on the side of upholding the Affordable Care Act. The governor also is expected to highlight some of the executive actions taken in her first month to address problems. She likely will note her executive orders last week restructuring the embattled Department of Environmental Quality (DEQ). The GOP-led House promptly overrode one of the measures because it scrapped DEQ commissions that give more input to businesses on environmental rules. Republicans who run the Senate have not decided whether to follow suit. 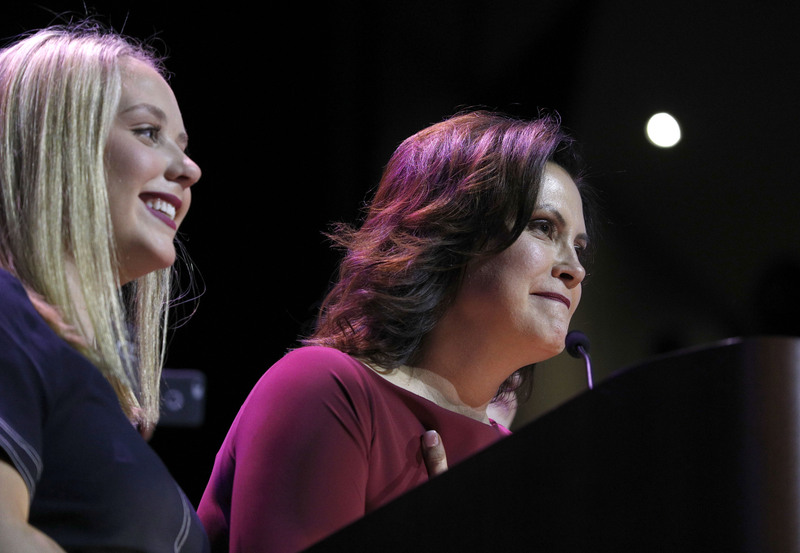 Whitmer is likely to talk about her other executive directives on encouraging equal pay, awarding more state contracts to businesses from low-income areas, barring LGBTQ discrimination and more. Like other governors, Whitmer will wait to unveil most big policy proposals until her budget message next month. However, the Advance has learned that she is expected to outline a concrete plan on making college affordable and providing a pathway for skilled trades training. Finally, the governor will talk about working with the Legislature. And she is expected to lay down the marker for getting a budget done before summer — months earlier than the Sept. 30 deadline — just as Snyder managed to do. The Republican, however, enjoyed the advantage of having strong legislative majorities to help him. Whitmer does not.